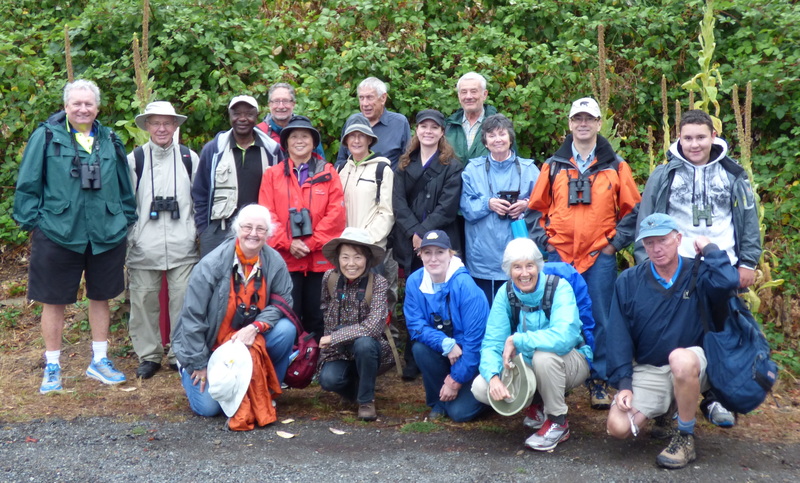 On Wednesday, seventeen “weathered” birders enjoyed a wet but mild ferry ride and strenuous but healthy walk around beautiful Galiano Island. The idiosyncratic group included: our self-proclaimed Leader Roger with newbie ferry-afficionado Kristin, our chauffeur White Rock Al, photog & administrator Terry, the quiet ones Sheila & Hans, PB Lorna back in the fold, Point Bob’s Kelly, Garbling Gerhard, loquacious Jane and Julian, photog Jonathan & Lorraine, returnee photog David, Richmond Donna, keen-eyed Kay and me. See Hi-lites below. 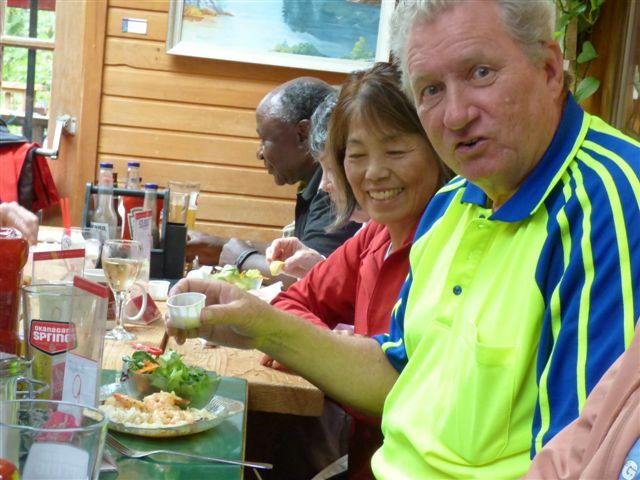 Check out Terry’s and others’ photo evidence on our Picasa site at our DNCB Picasa site. We met at the Tsawwassen Ferry Terminal and took the 10:20 a.m. ferry to Galiano Island. Before departing, we watched young families of nesting Glaucous-winged Gulls, both Pelagic and Double-crested Cormorants and Harbour Seals hanging around the terminal. We did not see the reported nesting Peregrine Falcon nor any Whimbrels. Some had the White Spot breakfast on board and, despite the rain, most spent much of the trip across the Strait outside on the deck. Only Julian and I braved the wind at the front bow. We saw nothing, but felt tough. Meanwhile, Terry got a nice shot of a Heermann’s Gull flying alongside. We landed at Sturdies Bay around 11:30 a.m. and gathered at the terminal entrance “berry patch” for Roger’s Group Photo. Then we started our walk along Sturdies Bay and Burrill Roads to Bellhouse Park, accompanied by our Cabbie, White Rock Al. The view out to Active Pass, watching the ferries go by was pretty awesome. One of a few Belted Kingfishers seen today was seen here. The trail circled through the beautiful native Arbutus and Garry Oak trees close to shore as we made our way back to the Park entrance and then on to Bluff Road. We wandered along Bluff Road to Mathews Point Regional Park. A hi-lite along the road for Gerhard and several others was the Blackberry bushes, dripping with delicious ripe berries which they gorged on. Our walk through this Park’s woods was particularly entertaining with WR Al & Roger’s “Big Word” competition. Someone would enquire as to the identification of individual trees (Douglas Fir, Western Red Cedar, Grand Fir, Arbutus, etc.) and the two experts would launch into tirades back and forth of Latin terms, biological descriptions and other gobbledy-gook about these trees and plants. Many of us acted enthralled, but most absorbed nothing. I learned that Arbutus Trees are just large Blueberry plants (actually just the same species group). We reached the start of the Trail down to the Hidden Beach. It was very steep and those that took it felt vindicated on reaching the idyllic secluded spot below, along the Active Pass. We got decent looks at Pigeon Guillemots which nest on the rock cliff next to this beach. We also saw Song and White-crowned Sparrows, American Goldfinches, Spotted Towhees and other “LBJ’s” (Little Brown Jobs, Pine Siskins?) in the shrubs on the cliff side. The climb back up was not as difficult for us bad-kneed folk, especially with the assistance of Trail Ropes. Back on top, we continued our march along Bluff Road, with WR Al doing yeoman service in carting small groups of “wimps” to the Hummingbird Pub. It was quiet along the road, bird wise, but some saw a couple of Helmeted Guineafowl (feral game birds?) 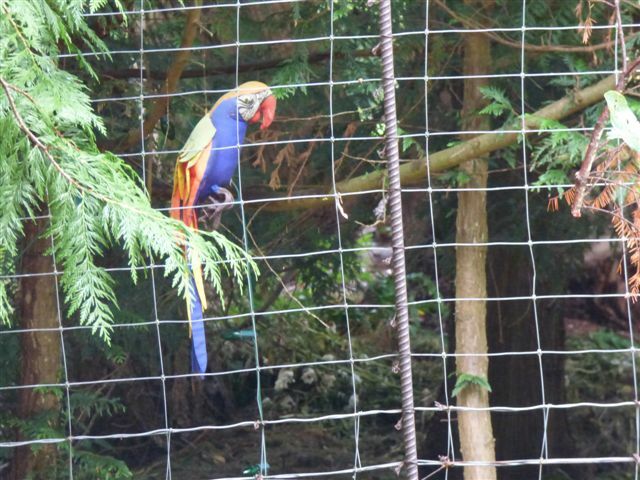 and Roger got a beaut shot of a “hybrid” Blue & Gold Macaw. A Cooper’s Hawk gave us a fly-past. The Hummingbird Pub was another interesting DNCB experience. Gorgeous setting and my “recommended” Prawns Hummingbird dish was delicious, of course accompanied with a (actually two) tasty 1516 Lager. I had little difficulty enduring the almost three hours of tedious and trite conversation. Roger took a couple of group photos of the dining crew. We didn’t see a Hummingbird, but in the Pub parking lot young-eyed Julian found a Brown Creeper. Fortunately, the two-kilometre walk back to the Ferry terminal was downhill. A few lucky WR Al riders got there quicker and were able to visit the Galiano Inn and tour their grounds. Several super sightings here including Western Tanagers, Yellow-rumped Warblers, another Cooper’s Hawk and Northern Flickers. And the famous Whale Mural in the Inn lobby, composed of sections by 50 artists who knew nothing about the final version, was captivating. On the walk to our 5:50 p.m. ferry, some stopped for ice-cream cones while others checked out the local Bookstore. It was fairly mild and not raining on the Ferry back to Tsawwassen, so most of us were outside at the bow. No unusual sightings but nice views with some comical discussion about our strenuous yet very enjoyable outing. Next Wednesday, August 20 we will leave Petra’s at 7:30 a.m. for an outing to Alaksen and Reifel, meeting at Reifel entrance around 9:00 a.m. A Reminder that Terry’s DNCB outing to Mt. Baker has been moved back to Wednesday, Sept. 3 (bad weather date is Sept. 17). Check out our DNCB Blog for additional info on these and other future outings. This entry was posted in *DNCB, Bellhouse Park, Cooper's Hawk, Galiano Island, Harbour Seal, Heermann's Gull, Pelagic Cormorant, Pigeon Guillemot. Bookmark the permalink.